Brace yourself to fall head-over-heels in love with Sonakshi Sinha and Anushka Sharma's latest, everyday desi casuals. 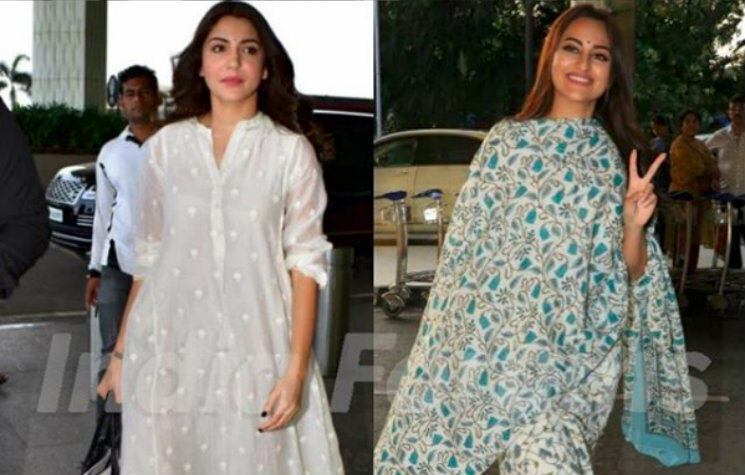 These Bollywood It girls were spotted at the airport earlier yesterday, effortlessly pulling off this season's trendiest salwaar-kameez style. From the cropped pant to the loose fit kurta, Anushka and Sonakshi proved that this quintessential Indian outfit can be in something as basic as a cotton fabric and yet look chic if one wishes to traditionally nail the summer months. Sonakshi made her way through the terminals in an easy-breezy, floral printed cropped pants layered with a matching kurta and dupatta. She tied her ethnic OOTD with a black tote and pair of white Kolhapuri chappals. Her beauty look was finished with a small black bindi. While that was Miss Sinha in a classic summer floral suit, Mrs Kohli was dressed in a white self embroidered kurta and contrast coloured cropped pants. Anushka accessorized her look with a pair of black chappals and Saint Laurent tote. Just like Sona, Anushka also sported a small black bindi on her forehead. Tiger-Kriti COMPLETE 5 Years in Bollwood; Share about their Journey... Kapil's Devils PLUNGE their Way into the Journey of '83!